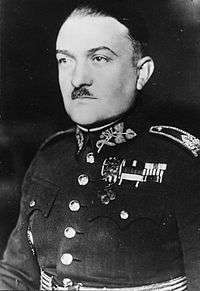 Alois Eliáš (29 September 1890 Prague – 19 June 1942 Prague) was a Czechoslovak general and politician. He served as Prime Minister of the Protectorate of Bohemia and Moravia from 27 April 1939 to 28 September 1941. He was involved in the Czechoslovak resistance during the Second World War. For his resistance activities he was - as the only Nazi-occupied state premier - executed. 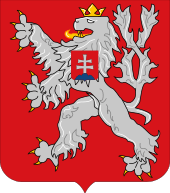 The first government under the Protectorate Bohemia and Moravia was only provisional in nature because it served as a successor to the government of Czechoslovak Second Republic. A replacement of the aforementioned government was discussed at the end of April 1939. The State President of the Protectorate Bohemia and Moravia Emil Hácha thought Alois Eliáš was his best choice. Hácha hoped that the popularity acquired by Eliáš during his earlier military career would prove beneficial to the puppet regime. He had served with the Czechoslovak Legion in France during World War I, and attained the rank of general. Although somewhat dubious, some historians have written that Hácha hoped Eliáš's former contacts with the Reichsprotektor Konstantin von Neurath could influence the Reichsprotektor of the desirability of Eliáš as the Prime Minister. Finally, on 27 April 1939, he was appointed Prime Minister. Eliáš took office with the conviction that he might have a unique opportunity to help his country. During his tenure, he gave support to the underground resistance to the Nazi occupiers. In early September 1941, Alois Eliáš planned to poison important Czech journalists who were actively cooperating with the Nazi regime. Eliáš officially invited the journalists to the Office of the Government. He brought sandwiches to the office of his urologist, whose name has been never published at the request of his family. At the urologist's office, the sandwiches were laced with botulism toxin, tuberculosis-causing Mycobacterium tuberculosis, and typhus-causing Rickettsia bacteria . Eliáš took the poisoned sandwiches to the Office of the Government. Although he handled this highly infectious material, he did not fall ill.
On 18 September 1941 the invited journalists ate the poisoned sandwiches. Karel Lažnovský, the editor of the journal Czech Word (České slovo), was the only fatality. Other journalists, including Jaroslav Křemen and Emanuel Vajtauer, fell ill.
On 27 September 1941, a week after the appointment of Reinhard Heydrich as the new Reichsprotektor, Eliáš was arrested, put on trial and sentenced to death. After Heydrich was assassinated in Operation Anthropoid nearly a year later, on 27 May 1942, Eliáš was finally executed at the Kobylisy Shooting Range as a part of the wide German reprisals for Heydrich's death. Eliáš was given a state funeral with full honours on 7 May 2006 and was buried at the National Monument in Vitkov in Prague. Kvaček, Robert, 2002. 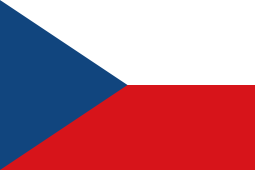 Czech History: Part Two [České dějiny II]. Prague, CZ: SPL-Práce, Úvaly, CZ: Albra.